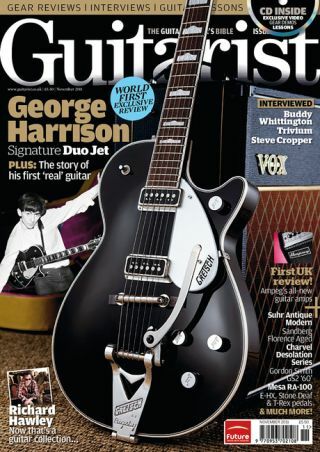 Guitarist issue 348 – on sale now! We tell the story of George Harrison's first 'proper' guitar, that he played on some of the Beatles most iconic hits, and learn the ridiculous lengths the Gretsch Custom Shop went to to recreate the incredible ding-for-ding £16,000 replica. PLUS! We review the all-new and significantly more affordable Gretsch G61218-GH George Harrison Signature Duo Jet! The solo troubadour and ex-Pulp guitarist looks back on his illustrious career, and shares with us his truly gorgeous vintage guitar collection. Guitarist Corey Beaulieu talks about the metal kings' latest brutal offering. The Stax legend tells us about the band who had a major influence on his playing style - the 5 Royales. This new programmable pedalboard from DigiTech combines your iPad with a hardware controller to create a touchscreen FX solution - does it work? We have the EXCLUSIVE review. Guitarist issue 348, is available now from all good UK newsagents. Non-UK readers can purchase a copy from www.myfavouritemagazines.co.uk, or UK readers can subscribe and receive a free gift! Guitarist Deluxe - the first full edition of Guitarist Deluxe, the fully-enhanced multimedia iPad edition of Guitarist will be available very soon - to download the container app from Apple Newsstand, please click here.